Not only are Zanussi cookers stylish and elegant but they are exceptionally easy to clean. From extensive Which? testing Zanussi Fridge Freezers scored excellently for temperature stability. Turn up the heat with a Zanussi hob! Electric hobs offer sophistication whilst gas gives you the traditional flame. 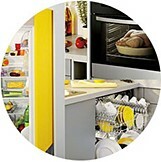 Zanussi cooling range offers a nice variety of fridges to meet all your fresh food storage requirements. Zanussi have a range of stylish single and double ovens that will compliment any kitchen. A Zanussi freezer will not only look good in your kitchen but also provide great food preservation. Microwaves are invaluable to any kitchen. Built-in models are popular as they create more worktop space. Time and energy saving features makes laundry day easier to give you the time to do the things you enjoy. Zanussi dishwashers are A rated for energy efficiency, washing and drying performance. Not seen the category you're looking for? Browse our entire Zanussi range here. Well Known and Well Loved - Their Italian flair and passion for well made, easy to use products is established and loved by conusmers. Over 42 Million Units Sold - Zanussi has sold an equivalent of 1 appliance for every 5 households in Europe. Greater Freedom - Zanussi appliances are so easy to use, they allow you to spend time doing other fun things. Italian Flair - Italian since 1916, developing appliances with real Italian flair and quality.